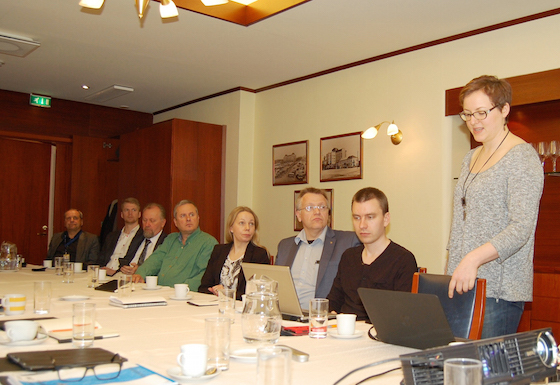 On Tuesday 26th May 2015, VASEK organised a workshop focusing on better space utilisation at the Port of Vaasa. The participants of the event included representatives from transport businesses and forwarding companies, the port, the City of Vaasa, the shipping company Wasaline, the Kvarken Council, the Regional Council of Ostrobothnia and VASEK. To get the conversation flowing, the Manager of Kvarken Ports, Matti Esko, described the recent developments at the Port of Vaskiluoto in Vaasa and the Managing Director of NLC Ferry Ab Oy, Peter Ståhlberg, talked about the changes at Wasaline over the last few years. The City of Vaasa and the municipality of Umeå have together received financing from the Northern Dimension Partnership on Transport and Logistics (NDPTL) for preparing the plans for improving the utilisation of the port space. Both the Finnish and Swedish side of the Kvarken are working on finding out exactly what is needed for the project. This spring, the consulting firm Pöyry in Vaasa has looked into how the space utilisation in the port area could be improved, and Project Manager Lotta Koski-Lammi presented the results of this work at the workshop. Pöyry’s report focused on the rail terminal area and the surroundings of the passenger terminal. The target was to improve the rail terminal area so that goods could be transported to the port also by rail, consequently boosting the operational conditions of the region’s industries. The aim for the passenger terminal area is to make the movements of the vehicles queueing for ferries simpler to prevent Reininkatu from becoming jammed during peak hours. The current problems in the Port of Vaskiluoto are caused by lack of space and the fact that the various port activities are located in different parts of the area. The current city plan also limits the development of the port. The report shows that, in the present situation, there are three alternative areas that could be used for the development of the rail terminal: the current railway yard area that includes the railway yards owned by both the City of Vaasa and the Finnish Transport Agency, the Reininlaituri quay in the port area and the Lassenlaituri quay in the port area, in the last of which the majority of freight traffic operations now take place. None of these areas is clearly better than the others and each requires investments before it can be used fully as a rail terminal area. The problem of vehicles queueing for ferries can be more easily solved by making improvements to traffic control and small reforms in infrastructure. Professionals in the transport and forwarding business gave expert assessments and excellent tips on the use of space in the port and how to improve it. The most radical suggestion – but perhaps the most practical in the long run – was to move passenger terminal functions from their current location in the middle of freight functions and place them on the Reininlaituri quay. This would give freight operations a larger continuous area and allow the rail terminal to be built in connection with it. Peter Ståhlberg, the Managing Director of Wasaline whose vessels travel the Kvarken between Vaasa and Umeå, is very happy that the ports of Vaskiluoto in Vaasa and Holmsund in Umeå are being improved. He is not at all surprised that the current passenger terminals, for example, have been topics of discussion in both ports. “Obviously these terminals, which were designed for a very large number of passengers, are oversized for today’s traffic,” he says. Ståhlberg and Markku Järvelä, the Manager of the Technical Department at the City of Vaasa, agree that the freight professionals working at the port brought many excellent points of view to the discussion. “When considering actions to be taken and their costs, it’s important to assess how far into the future these solutions should work,” Järvelä says.